Throughout the 19th Century, vests were an essential part of any gentlemen's clothing in civilian life. Whether he was a laborer or a politician, his vest was worn in public with few exceptions. When enlisting in the army in the 1860's, most men still desired to wear a vest, although most were upset to find out the quartermaster did not issue vests to troops (with the exception of some zouave units). This left officers and enlistedmen to search other areas to procure a vest. Some chose to bring their civilian style vest from home. The variations in color, style, construction and fabric choice among civilian vests were endless. Those choosing to wear military vests found that their choices were a bit more limited. Usually coming in an all wool material, these vests commonly featured a 9 button front, two or three pockets and came in light blue, dark blue or white. I suppose the biggest difference between what some consider a military vest vs. a civilian vest is the stand up collar instead of a shawl collar. One vest that survives the war is in the collection of Don Troiani of Historical Art Prints. 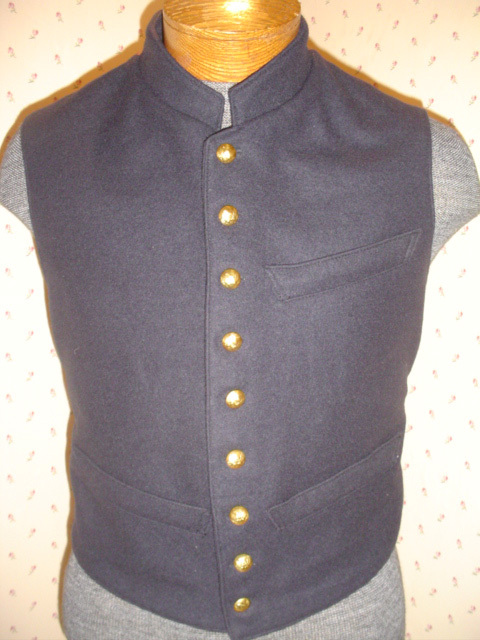 This vest was made from a french blue wool, exhibited three outside pockets, had a nine button front and a stand up collar. The topstitching was done by machine and the buttonholes and other details done by hand. The lining was white cotton and it was backed with brown polished cotton. With the exception of missing buttons, the vest itself is in great condition. There are some stains and one rip on the inside facing, but otherwise this 140+ year old garment is a great example of a 19th Century military vest. The author would like to thank Don Troiani and Historical Art Prints for permission to use these photographs in this article.